Keep pavers looking like new by sealing them with one of the many concrete sealers sold at RCP every 12 to 18 months, depending on how much traffic the area receives. It also may be necessary to add joint sand to your interlocking concrete paver area every so often to replace any sand that has been swept or washed away. When using concrete, asphalt, or gravel as a paving material you are limited by color choices, styles, and receive a low visual appeal. RCP’s Bella Vista interlocking pavers provide you with countless combinations of colors, patterns, styles and finishes assuring the uniqueness of your project. 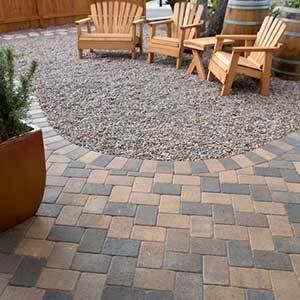 This variety assures that your paving project will stand out from all the rest.